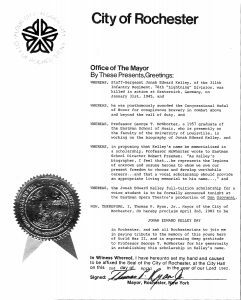 Ed Kelley’s memory became legend via posthumous awards throughout the United States and abroad. 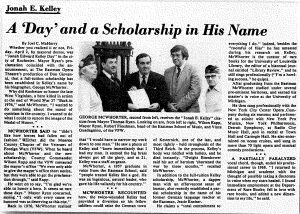 His family received his Presidential Citation, Medal of Honor and Purple Heart awards in 1945; in 1946 the Kelley Awards annual program was established at Keyser High School; in 1952 the Kelley Barracks was dedicated at Stuttgart, Germany; in 1947 the S/Sgt. 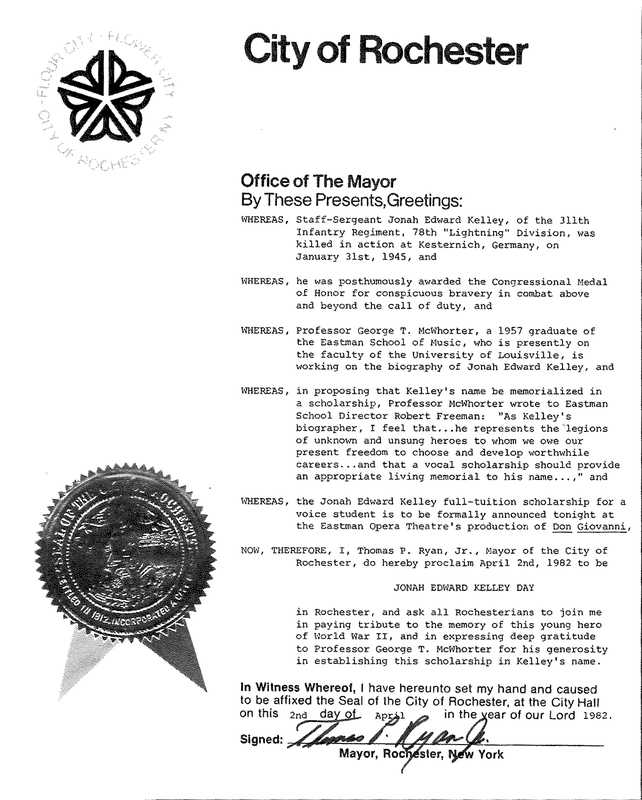 Jonah E. Kelley cargo ship was named; in 1963 the Kelley Armory was established on Kelley Drive, Keyser, West Virginia; and in 1992 a music scholarship was established at the Eastman School of Music in Rochester, New York for Kelley, with a special memorial day celebration given by the Mayor of Rochester. 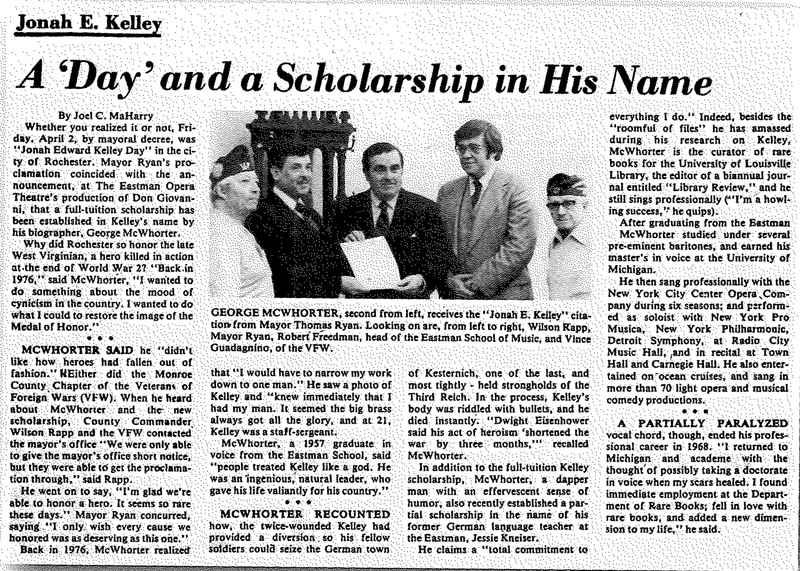 Photo shows newspaper article on “Jonah Edward Kelley Day” in 1982 when Mayor of Rochester, Thomas P. Ryan, Jr., at center, presented citation to donor of Kelley scholarship to the Eastman School of Music, George T. McWhorter (second from left), Dr. Robert Freeman, Director of Eastman School of Music (second from right); flanked by two members of the Rochester chapter of Veterans of Foreign Wars, Wilson Rapp (far right) and Vince Guardagno (far left). The Kelley Day celebration was further honored by a special operatic performance of DON GIOVANNI by Eastman School students, including Renee Fleming who later became a reigning diva with the Metropolitan Opera.